at how we were able to spend 2015 with you! February kicked off two events. Theatre Gigante performed our Peter & the Wolf & the One-Man Band, created by Isabelle, through the Milwaukee Symphony ACE Program, traveling to nine schools and reaching approximately 550 children. The piece is presented yearly to first graders and is always a resounding success, with the symphony office getting excellent evaluations and comments on Gigante’s program! February also saw Paris artist, Christine Zufferey, “a chanteuse with a powerful and clarion voice” make her Milwaukee debut as part of Theatre Gigante’s Studio Series, in concert with Boston-based guitarist Catherine Capozzi. Full houses enjoyed Christine’s powerful voice along with the virtuosic playing of Catherine. Donated onion tarts from Chez Jacques and boutique beer from Brenner Brewing Co. added to the fun! This event was supported in part by the Meyer & Norma Ragir Foundation. In May, Gigante brought Milwaukee another first when we presented the work of Mark O’Rowe, one of Ireland’s foremost contemporary playwrights. Gigante played O’Rowe’s TERMINUS at Kenilworth 508 Theater to critical acclaim! Gigante also previewed TERMINUS at Boswell Books…big thank you to Daniel Goldin! TERMINUS was supported in part by long time Gigante friend Nic Bernstein! July swept in the 2015-2016 season with a bang, bringing another innovative and unique first to our community, LITTLE BANG THEORY. As part of Gigante’s Studio Series, audiences were treated to evenings of Ladislav Starewicz’s animated films from the 1920’s and 30’s with original, ingenious music by Little Bang Theory, performed live entirely on children’s instruments and toys. Once again, Mike Brenner provided Brenner beer and the Board of Directors provided food for the event! In October, Gigante presented RUMORE DI ACQUE at Kenilworth 508 Theater. Milwaukee audiences were introduced to the work of Italian playwright Marco Martinelli and incredible actor Alessandro Renda, members of Teatro delle Albe, Ravenna, Italy. Joining Alessandro on stage was composer/musician Guy Klucevsek who played his beautiful and soulful music, and actor Thomas Simpson, who also translated Rumore into English. Many outreach activities occurred around the Rumore production: an interview on television for the UWM Institute of World Affairs (IWA) and on radio for Lake Effect; master classes took place at UWM’s Theater Department and Pius High School; a forum and/or classroom visits were presented at MATC, MIAD, and at Milwaukee’s High School of the Arts. (The MATC forum was packed with 200 students!) Gigante also partnered with the Pan African Cultural Association (PACA). A panel discussion took place at the theater before the matinee performance, which involved Gigante, PACA, and IWA. The matinee was attended by several refugees, who actually made the perilous journey across the Mediterranean and are now living in Milwaukee. Students attended the performances from Pius, MIAD, MATC, and UWM. Performances were followed by talkbacks. RUMORE DI ACQUE was supported by the Milwaukee Arts Board and an anonymous foundation through Board president Jane Kramer. 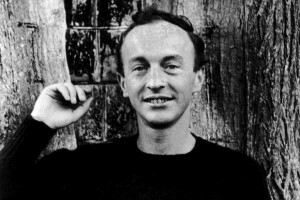 December brought about another Studio Series event, BEAUTIFUL & POINTLESS, an evening of five, rarely performed short plays by poet Frank O’Hara. Directed by Isabelle and performed by 11 performers, the production played to three full houses – great fun was had by audiences and performers alike! Again, Brenner Brewing Co. donated beer, and the Board of Directors supplied cookies and chocolates! The year ended with Isabelle performing at nine schools through the Milwaukee Symphony ACE program (with four wonderful symphony musicians) in Architecture and Foundations in Music and Dance. Finally, this newsletter brings us to our year-end gift request. As you can see, Gigante brings much original programming to Milwaukee – many firsts – that would otherwise not be seen here. Gigante’s work is hybrid and an alternative to conventional theater and dance. We can’t do it without you! Our work is made possible by your support. You help ensure the innovation and original artistic programming Gigante is known for! We thank you for everything – your friendship, your attendance at our shows, for reading this long newsletter, and for supporting us! “Beautiful and Pointless” provides something different during holiday theater season. Theatre Gigante has always marched to its own drummer, and this weekend it took a long detoured stroll around holiday traditions with Beautiful and Pointless, an evening of plays by New York poet Frank O’Hara. I suspect Gigante’s Mark Anderson and Isabelle Kralj’s attraction to O’Hara is due to his eclecticism. He was a poet, playwright, art critic and curator at the Museum of Modern Art. And like most modernist poet-playwrights, his theater is filled with thrilling language, but skimpy on psychology and other traditional dramatic elements. But no matter. Beautiful and Pointless brought ten fine actors together to perform five of O’Hara’s plays, and there were many pleasures, thanks to some thoughtful ways to approach the material. In Grace and George, for example, director Kralj decided to have Michael Stebbins read O’Hara’s stage directions aloud. And this play about a couple (John Kishline and Deborah Clifton) working out relationship issues came alive with sound and metaphor. Lexington Avenue–a play in which a herd of sheep and subway stop play equally important roles–became a short musical in the hands of Jason Powell, who kicked up the drama to gleefully absurd levels (Powell performed with Erin Hartman). Daphnis and Chloe on a Very Rainy Night, originally staged by the late Ed Burgess, was enlivened by the addition of Stebbins as leather jacketed poet-narrator—think part Wallace Shawn and part Lewis Black—who brought some tongue-in-cheek solemnity to the story of the mixed up mythological couple (played by Kralj and Mark Anderson). The first two plays, Try! Try! and Change Your Bedding!, were played mostly straight—the first as a melodrama about a cuckolded soldier returning home, and the second a family drama played in Japanese Noh style. The stories were legible, but the real pleasure was in the pure wash of O’Hara’s lovely language, spoken by talented actors (Kat Wodtke, Stebbins, Evan James Koepnick, Tom Reed and Kralj).